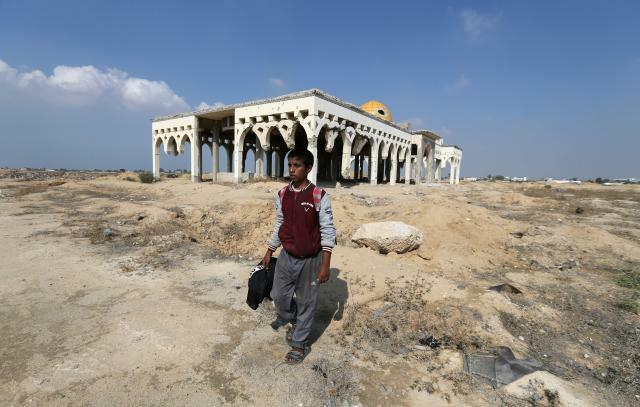 On many days, Hamza Abu Shalhoub is the only person sitting inside the derelict VIP lounge of what used to be Gaza International Airport. Hemmed in by Egyptian border posts to the south and Israeli watchtowers to the east, he makes a living by trying to trap and sell songbirds, using other caught birds as lures. Goldfinches are the real prize, he says, because they still sing in captivity. He can make $30 for a goldfinch in the market, but has only ever caught one, and usually makes do with lesser catches. His older brother Shadi, 24, has had more luck, catching 12 goldfinch since he started a decade ago. It’s not much of a job, rising at dawn every day to spread their nets among the garbage-and-debris strewn former airport buildings. But with poverty rife and youth unemployment at 70 percent in Gaza, Shalhoub said he did not have much choice. He left school seven years ago at the age of nine. “When I was at school I dreamt of becoming a teacher, but my father took me out of school to help him earn money for the family,” he said, sitting in winter clothes and warming himself in front of a pot of coffee on an open fire. His favorite subjects were English and Arabic, he said. To snare the birds, the brothers tie a string to the leg of a captured goldfinch. They hope the sight of a bird on the ground will tempt wild birds to come down, thinking there are worms there to be eaten. Once the birds land, they flip the nets onto them. They also place three recorders around the airfield, playing sounds of birds. They mostly catch smaller birds, which only fetch about $1.5 but still put food on the table. The brothers chosen hunting ground is itself a symbol of thwarted Palestinian hopes for sovereignty and economic independence, as the Palestinians’ only direct link to the outside world that was not controlled by Israel or Egypt. Former U.S. President Bill Clinton attended the opening ceremony on Dec. 14, 1998, and it was used for a short time by visiting dignitaries, including South Africa’s former President Nelson Mandela. But Israel destroyed its radar antenna and runway a few months after the Sept. 11, 2001 attacks on the United States. The Israeli government deemed it a security threat at the height of the second Palestinian uprising known as the Al-Aqsa Intifada. Israel withdrew its settlers and soldiers from Gaza a few years later, in 2005, but maintains tight control of Gaza’s land, air and sea borders, while Egypt controls access from the south. Israel says the restrictions are to stop weapons entering the Strip and to isolate Hamas, the Islamist movement which has controlled Gaza’s two million population since 2007. But the economic plight of the Strip has fueled anger. A World Bank report in September said Gaza’s economy was collapsing, citing “a combination of war, isolation, and internal division”. As the conflict grinds on, few now even remember that Gaza once had an airport. But Abu Shalhoub, although too young to remember it in operation, sits among the surviving fragments that are a daily reminder. “I dreamt that the airport was rebuilt,” he said during one break in hunting.